Employee development looks a lot different today than it did just a few years ago. This ebook details 10 trends that are crucial for keeping up with the ever-changing future of work. The modern workforce is a place where baby boomers, Gen X, millennials and now Gen Z all share the same Nespresso machine. That’s four distinct generations with different views, expectations and priorities. Companies will have to adopt new methods for just about everything - from recruitment and benefits to employee development and career planning. While there are several key differences between each generation in the modern workforce, how companies should treat them can be summarised in one word: individually. 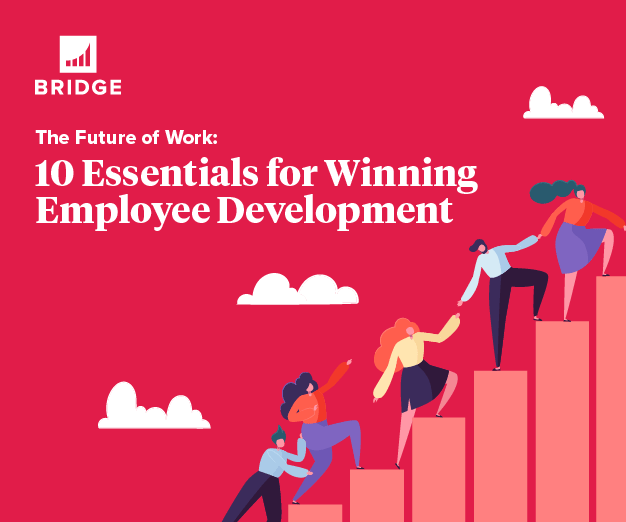 This ebook is designed to help HR and L&D professionals who want to turn their organisation into a learning environment well-equipped for the workplace of tomorrow, do exactly that - seamlessly motivate and develop employees of all types, ages and roles through employee-centric tools and practices development. Bridge, from the makers of Canvas, is employee development software that creates a positive employee experience and increases engagement through purposeful learning, continuous feedback, collaboration, skill building, and career development. We empower businesses to develop, retain, and promote their most valuable asset—their people.